Post written by Rebecca Arbolino, J.D. expected 2017.
climate change poses an immediate and far-reaching threat to people and communities around the world and has adverse implications for the full enjoyment of human rights. Leaders at the General Assembly touched upon various issues, but the need to counter climate change was a highlight of the seventieth session. Although tempers flared under the guise of political niceties, leaders otherwise prone to dissonance agreed upon the importance of sustainable development initiatives. During the general debate, for example, both Vladmir Putin and Barack Obama reached an uncharacteristic accord on the topic of sustainable development. fundamental and new technologies…which would not damage the environment, but would be in harmony with it. “a world where human habitats are safe, resilient and sustainable and where there is universal access to affordable, reliable and sustainable energy” by 2030.
concrete steps and immediate measures for preserving and improving the natural environment. Great job writing this article. Climate change is a topic that should be discussed more on a global context. The effects it will have in future international conflicts are already on display in the Middle East. The Right to a Habitable Environment as a fundamental human right is important for all of humanity. 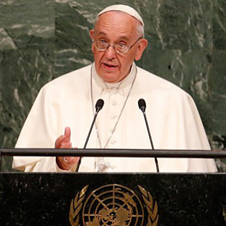 Pope Francis’s global plan to end poverty, reduce inequalities, and protect the environment is ambitious, but achievable. It seems that some of the world super powers are finally addressing the need to protect the environment. Hopefully these multilateral agreements are implemented.